This photo was taken using a 35mm television camera that was attached to a V2 rocket that was launched from New Mexico. Following the end of World War 2, and the Allies capturing German technology, this rocket was used for science rather than destruction. 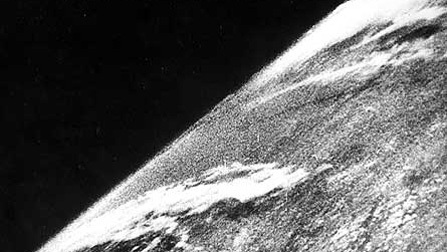 It’s important to note though that this image, while being the first from orbital altitude, is not the first image from orbit – since the V2 rocket in this flight never actually went into orbit. It simply went straight up – 105 km straight up – and then straight back down. Nevertheless seeing our blue marble (or black and white marble, as the case may be) from such a perspective was an important milestone. Nowadays, a significant number of our satellites are actually pointed back down towards Earth, and astronauts aboard the International Space Station spend a significant amount of their time likewise observing Earth. This perspective is a meaningful one and helps us to better understand how our planet actually works. For more on this, check out an awesome website: The Gateway to Astronaut Photography of Earth, hosted by NASA’s Johnson Space Center.